This lovely and beautiful Green Peridot Round Cut Diamond Channel Inlaid Ladies Ring is expertly crafted in 14K White Gold. A beautiful elegant piece. 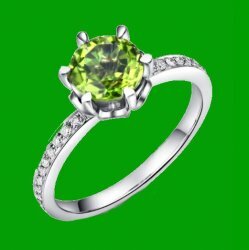 Pretty, enjoy this Green Peridot Round Cut Ring. Each ring features One (1) Round Cut genuine Green Peridot Gemstone measuring 7.00mm in diameter . Each ring has twenty (20) round shaped Genuine White Diamond Gemstones inlaid into double bands around the main gemstone. Colour - H Clarity VS-SI Weight 0.147 carats. Presented in an elegant lined gift box. The gold metal weight of this pendant is 2.95 grams. The stone weight of the Green Peridot and Diamonds is 1.547 carats. This Ring is also available in 14K Yellow and Rose Gold, 18K Yellow, White and Rose Gold, please see the drop down menu my other listings in store for pricing and details. Please see drop-down menu for sizing options available. Sizes above United States 8.5 will incur additional costs for the extra materials needed to make this piece - details are included. Bold curves, luxury, smoothness. Wearing this beautiful ring will provide any woman great satisfaction. The superior craftsmanship and timeless design of this ring will compliment any tailored ladies evening wear exceptionally. Please be advised that your item needs to be cast and made before it can be sent to you. Please allow for sufficient time for your order to arrive.